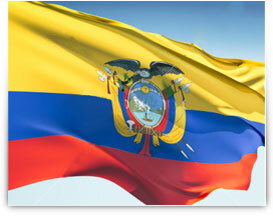 As a country ECUADOR is truly blessed with a bountiful of ecological, cultural and Bio diversity. The lush green Amazon rainforests, sun soaked beaches along the pacific coastline, snow capped Andes and ofcourse the greatest Natural Wonder of the world - GALAPAGOS islands! Ecuador is home to 44 nationally protected natural parks and reserves. It has been declared as amongst the most Mega Diverse countries in the world The Sangay and Galapagos Parks have been declared UNESCO world heritage sites! Ecuador's rich history and architecture are visible in the cities of Cuenca, Guayaquil and Quito. Quito is proud of its 'old historic city' area which is Latin America's best preserved historic colonial center. Ecuador is the only country that offers the opportunity to visit the 1st measured equatorial line in 1735. The Ecuadorians are known for their warmth and hospitality towards all foreigners and they go out of their way to make the tourist feel at home!